Installing a new patio door. A small project to make a place to park the kid's Power Wheel's jeep outside becomes a larger one to create a true kid's "garage and workshop"! In early August 2006, we built a playground for William. As usual, we took some pictures along the way. In 2005 we demolished our old deck and replaced it with a new, larger one. 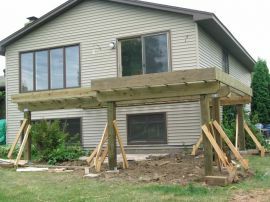 Follow along with our "deck blog" written at the time and see how it was done! In February-March 2004 we replacing our wrought-iron stair railings, which were pretty dated looking, with new oak railings. 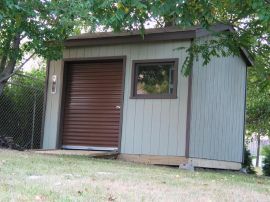 In July-August 2003, we added a storage shed to our back yard in order to free up some space in the garage and park the John Deere lawn tractor in. Finished ShedAnother view of the finished shed from a side angle. Eventually we will add some landscaping to soften the edges and foundation of the shed. Front completeThe front sheathing is now complete, windows and small door have been trimmed out, etc. Next the gables will be done. Finished ProductThe final step was to paint all of the trim dark brown, again to match the trim on our home. 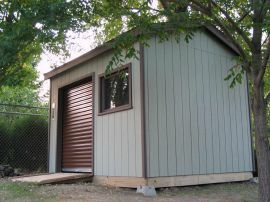 Here, you see a view of the finished shed! Framing FinishedWe didn't pause to take any other photos-- this one shows where we stopped for the day when rain started falling. The front of the building will have a roll-up door and a window (being demonstrated by Cathy). 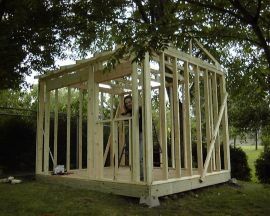 We made good progress before the rain-- getting all the walls framed and trusses up and temporarily braced.